Note that this is the numpy sort routine, operating on the first 3 rows of a numpy 2D array. Having generated the code that was returning numerical results in the desired format, it was just necessary to check that the results were correct, however a quick check soon showed that they were not. was always evaluating to 1 or -1, i.e. to -sgnR. The problem was due to the fact that in Python version 2 division of two integers always returns an integer, so 1/3 = 0. To get a decimal result in Python 2 at least one of the two values must be non-integer, so 1./3 = 0.3333333333333333, and yields the correct result. to the top of the code module. This line causes Python Version 2 to use the Version 3 rules for division, which yields a decimal result when two integers are divide, rather than an integer. 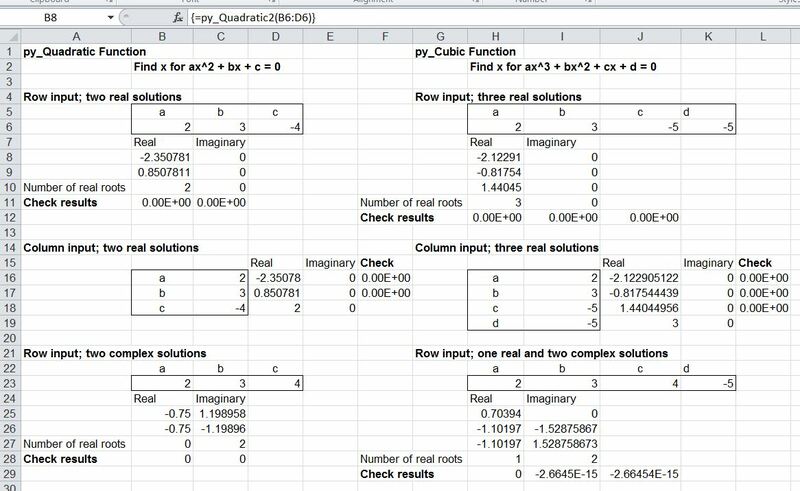 This entry was posted in Excel, Link to Python, Maths, UDFs, VBA and tagged Excel, Python, PyXLL, Quadratic function, Translate VBA to Python, UDF, VBA. Bookmark the permalink.